It’s true, Madison on Halloween weekend was definitely a sight to behold, though I preferred to enjoy the party comfortably from the second floor of Brats, overlooking the mass of revelers taking over Sate Street. You also might argue that "party" could easily be substituted with "riot." No tear gas for me, thank you very much. There are always the ubiquitous ladies who throw on knee high socks, a tiny top, antennae headband and wings, and I would be happy to join them if Halloween fell on, say, July 31. The brisk fall weather, however, tends to make me want to layer up. I embraced this sophomore year of college with my Marty McFly costume. If you look closely, Michael J. is actually wearing FOUR layers: red t-shirt, button down, jean jacket and the puffy vest ("I guessed you're a sailor. That's why you wear that life preserver"). Toasty. Threw on some old school headphones, 80s rolled my jeans, jammed into some old high top sneakers and I was all set. . almost. Although I am typically anti-prop (it’s too hard to keep track of costume parts that aren’t attached to your body during a long night out! ), I printed out the "disappearing siblings" photo in case there was any doubt about who I was. I always wanted to get a group together and be Madonna through all of her phases. Failing that, I struck out on my own senior year with "Like a Prayer" Madonna. Curled and teased my already dark hair, drew on some extra thick eyebrows and a mole and wore a nice big cross necklace over a dress. Okay, so I broke my own rule of not under-dressing, but when "Like a Prayer" came on at the bar? Totally worth it! And because I wasn’t quite done with Madison, I headed back the fall after graduation to celebrate as everyone’s favorite waitress from Office Space. I ordered a bag of pins from eBay (I seriously think that was how it was listed – “bag of pins for sale." Check out the Wayne's World one.) and stuck the minimum 15 pieces of flair all over a pair of suspenders. 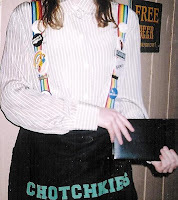 Bought a close-enough green striped shirt from the thrift store and used a friend’s old money belt and check holder from her time as a Friday’s waitress. I bought felt iron letters to attach the restaurant name to the money belt. I think I did Miss Aniston and Chotchkie’s proud that night. Last year I strayed from my pop culture roots and came up with a costume after trying random stuff on in my closet. A white button down shirt, scarf, high waisted khaki capris and tall brown boots. . .hmm. . .add a beret and a megaphone and I could be an old timey director or add goggles and a helmet and I could be an old timey pilot. 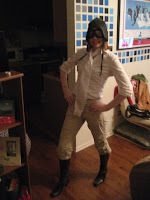 My anti-prop stance prevailed as I did not feel like dragging around a megaphone - so Amelia Earhart I became! Realization after a night at the bar: goggles get HOT and steam up so you can’t see anything. Had to spend most of the night with them on top of my head. Plans for this October 31 are still TBD. . .time to get busy thinking of who I’ll be this time around! - A group of girls dressed as all the female superheros with POW and KAZAAM signs around their fists. - "Who Wore it Best" between a girl and her boyfriend. Takes a manly man to wear a dress and a classy lady to lose to him. - Michael Jackson . . .too soon? *Fun Fact: I lived above the Taco Bell in the top photo for one glorious summer. I think Drew and I are going as Bonnie and Clyde this year. I have my grandma's old dress and he has a pinstripe suit...just have to find some faux-guns. Luckily there are like 8 Halloween stores around here right now.